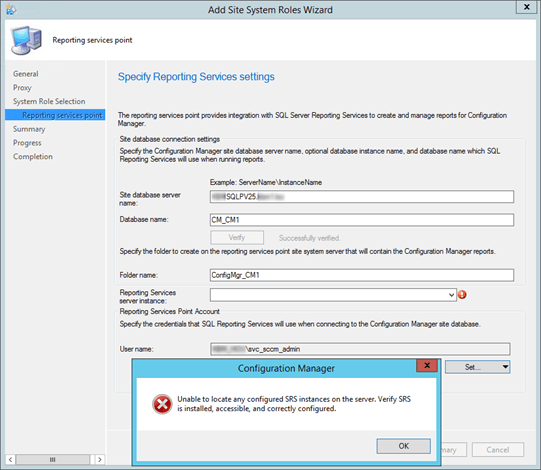 In a new ConfigMgr 2012 R2 SP1 environment the Reporting Services point was proving a bit challenging to install. After setting all of the required permission it was finally happy. 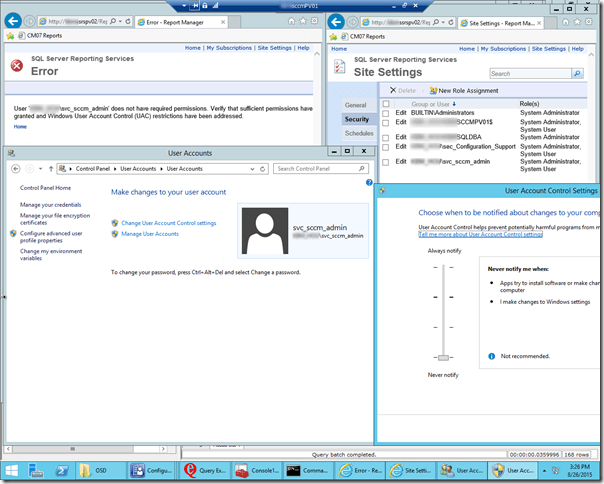 This ConfigMgr environment has a complex configuration with 3 different SQL servers in play. 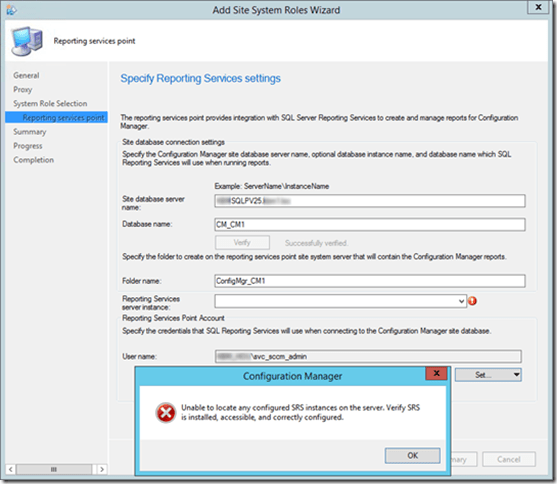 Unable to locate any configured SRS instances on the server. Verify SRS is installed, accessible, and correctly configured. The "Reporting Services server instance" is blank. We knew that SSRS was installed, configured, and working as there were two other applications already using the SRS instance in a production capacity. the account could not see any existing reports or report folders and the following message displayed: "User ‘<domain>\<userID>’ does not have required permissions. Verify that sufficient permissions have been granted and Windows User Account Control (UAC) restrictions have been addressed." As the screen shot shows, UAC was actually disabled already. 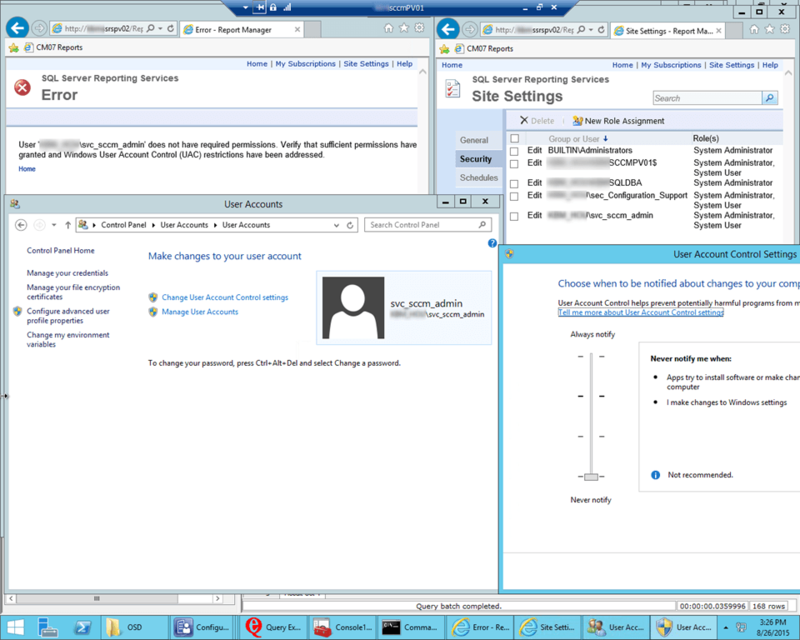 Once the domain user account was given rights to the root folder, the Reporting Services point role could see the Reporting Services server instance the the role installed without issue. After the role installed, ConfigMgr reset its own permissions to give the domain user account only "ConfigMgr Report Users, ConfigMgr report Administrators" roles. 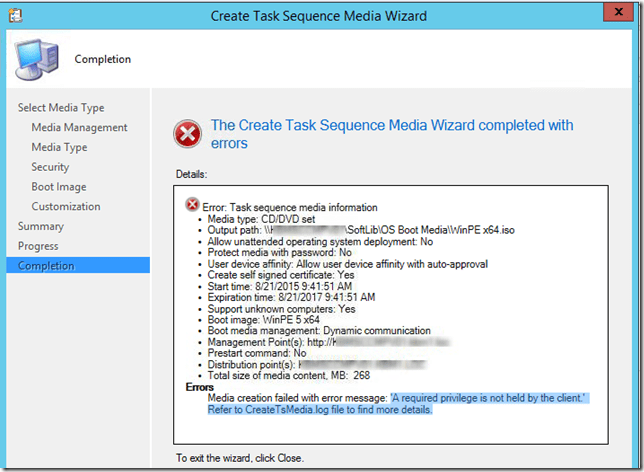 When preparing a new Windows Server 2012 R2 system for a new ConfigMgr 2012 R2 site, I ran into an error installing the Windows ADK. In this case it is version 10; however, I believe the same scenario would apply to 8.1 Update, 8.1, 8, etc. 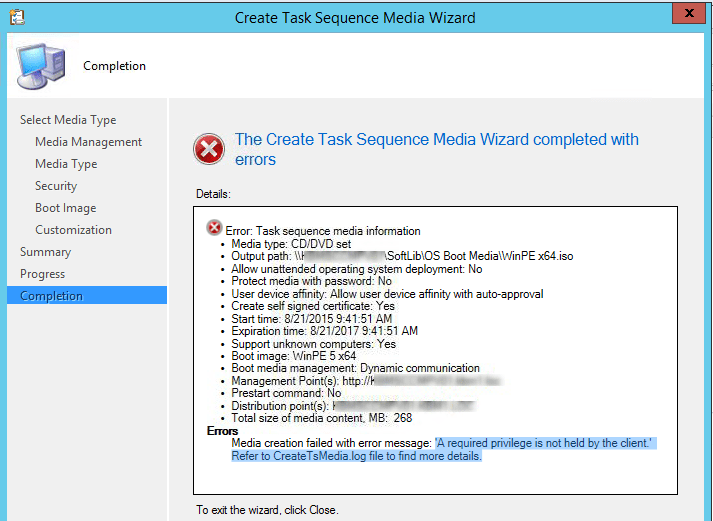 Additionally, after installation was successful, it was not possible to mount a WIM or create boot media in ConfigMgr. Error: 1313 A required privilege is not held by the client. Refer to CreateTsMedia.log file to find more details. Error: 1313 A required privilege is not held by the client. In my case the root cause was that a default permission was removed for the local Administrators group by a domain policy. By default, the User Right Assignment for "Back up files and directories" and "Restore files and directories" is held by the "Administrators, Backup Operators". But in this case the "Administrators" group had been removed and replaced by the "Domain Admins". Since my account isn’t and shouldn’t be a domain admin, I simply added it to the local "Backup Operators" group, logged off, logged back on, and presto! Success. If the User Right Assignment isn’t you issue, another solution, or rather workaround, is to run the installation as the SYSTEM account. 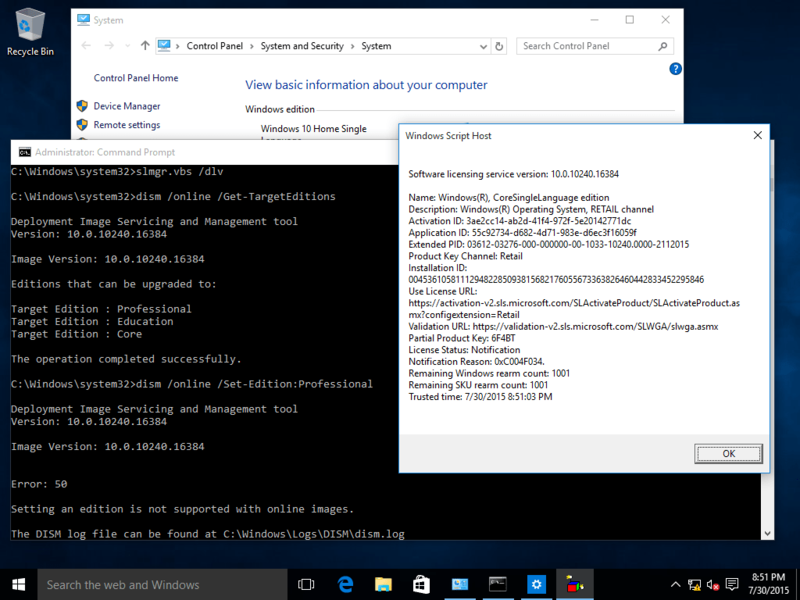 manually running the ‘Windows Deployment Tools-x86_en-us.msi‘. 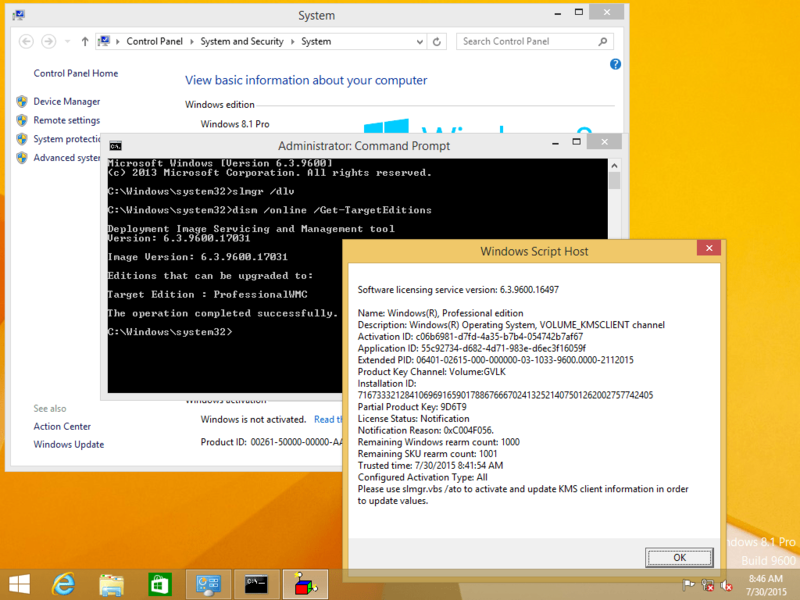 Strangely this succeeded; however, when re-running the ADKsetup.exe, the same failure occurred. manually running the ‘Windows System Image Manager on amd64-x86_en-us.msi‘. Strangely this succeeded; however, when re-running the ADKsetup.exe, the same failure occurred. Several forum posts were found with a resolution pointing to a blog that has since been taken down. That solution required removing the computer from the domain. This solution was not attempted. There are a few ways to gain SYSTEM account access; however, I took the interactive route and used PSEXEC from Sysinternals. Thanks to Adam for working through the issue with me. There are a few instances of the same error documented in a few blogs and forum posts. The options basically include ensuring you are running as an administrator (and with the administrator token), running as SYSTEM (as described in my workaround), or dis-joining the computer from the domain and running as admin. What eventually worked around the problem was to run the installation as the SYSTEM account. The synopsis: Using Windows 10/8.1 Enterprise media, Windows Pro can be upgraded to Enterprise edition while keeping installed apps, personal files, and settings. The story: I ran into an interesting scenario where I needed to run Windows 8.1 Enterprise. Pro just wouldn’t cut it because of the lack of support for BranchCache, DirectAccess, etc. Keep in mind that I’m specifically referring to a technical solution and NOT a licensing solution to this challenge. A valid license is still required. After digging around the web I found 3 primary resources for the conversion or upgrade. The TechNet forum thread (https://social.technet.microsoft.com/Forums/windows/en-US/305ac35b-9a14-4244-8e95-dd0b0c23b70a/change-windows-8-pro-to-enterprise?forum=w8itprogeneral) goes though a transformation part way down as new information became available. There is also confusion by focusing on by licensing and technical aspects. For the moment, ignore the thread. After reading this post to the end, come back to the forum thread and re-read it with more/updated facts in mind. The TechNet article (https://technet.microsoft.com/en-us/library/hh825049.aspx) applies to Windows 8/8.1 and Windows Server 2012/2012 R2. Using the command below you can see what Editions of Windows the running computer can upgrade to. You can then, theoretically, use another command to change the Edition. This sounds great and may actually work in some scenarios, but not the one I needed. The TechNet article (https://technet.microsoft.com/en-us/library/jj203353.aspx) applies to Windows 8/8.1. 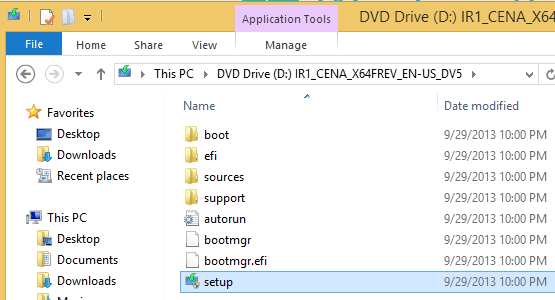 Using media (ISO, USB drive) Windows 8/8.1 Pro can be upgraded to Windows 8/8.1 Enterprise, but the language is misleading. 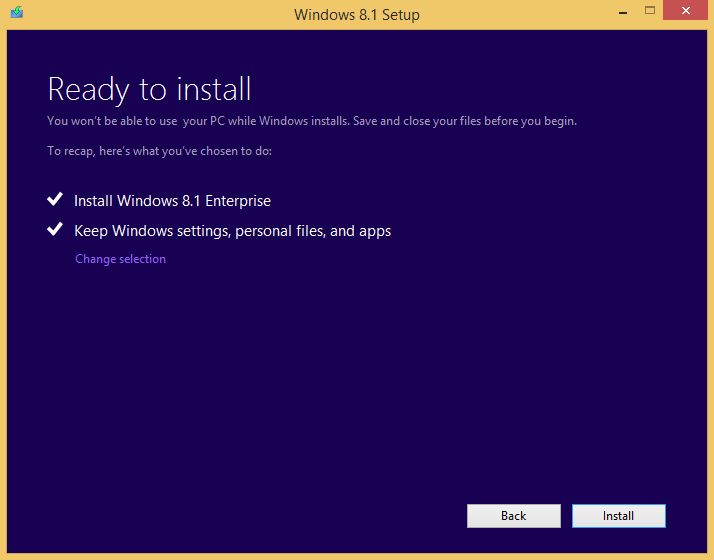 Windows 8 (non-pro) can be upgraded to Windows 8.1 and you can keep Windows settings, personal files, and applications. 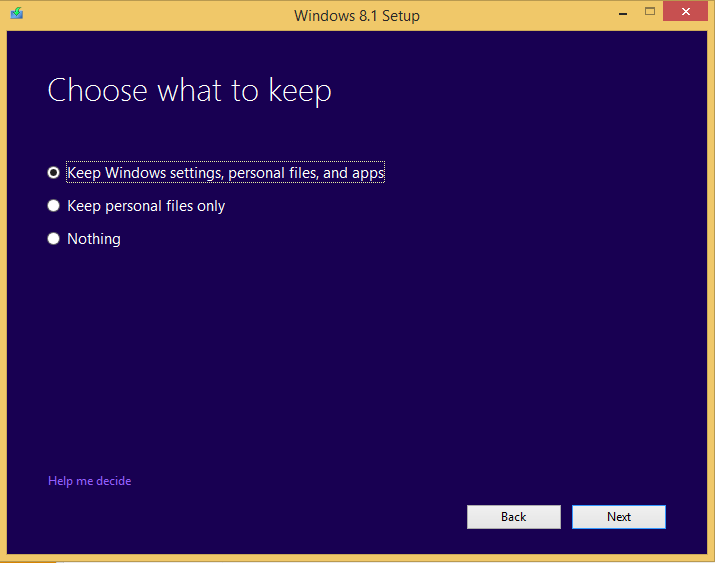 Windows 8/8.1 (non-pro) and Windows 8 Pro/Pro with Media Center can be upgraded to Windows 8.1 Pro and you can keep Windows settings, personal files, and applications. Interestingly, the Pro to Enterprise section does not mention anything about keeping any settings, files, or apps. The next section makes a note about not keeping settings, files and apps during a cross-language installation, then a table follows that shows several scenarios and what you can/can not keep. Pro to Enterprise is not listed in the table. Thus the implication is that during a Pro to Enterprise upgrade, you can’t keep any existing data or customizations. As it turns out, this is just a lack of specificity in the article. 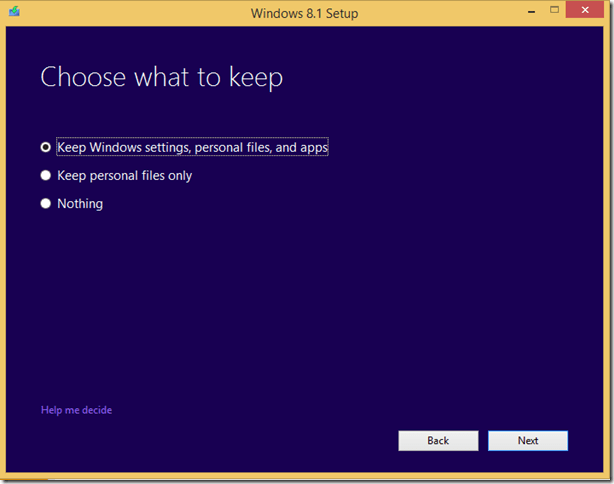 Upgrading Windows 8.1 Pro to Windows 8.1 Enterprise does give the option to keep settings, files, and apps… and it works. 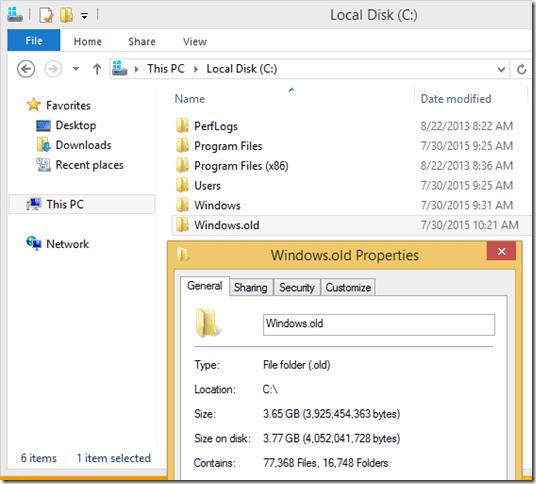 Do remember, that this is an OS upgrade… the existing installation of Windows is moved to the Windows.old folder and a new installation of Windows is created. 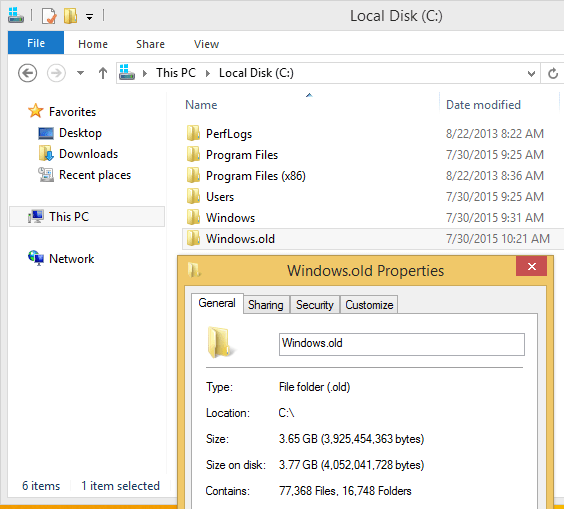 Ensure you have a good 5+ GB of free space on the system drive (Drive C). 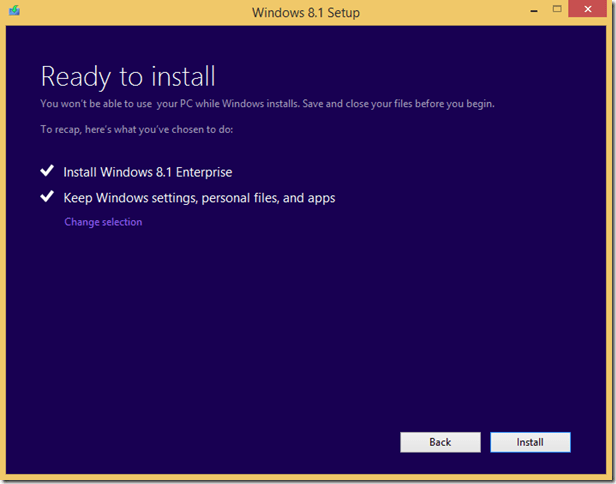 Windows 8.1 Pro upgrade to Enterprise. Windows 8.1 Pro installed using the sample GVLK KMS key. DISM shows that the only Edition which can be upgraded to is Pro with Media Center. 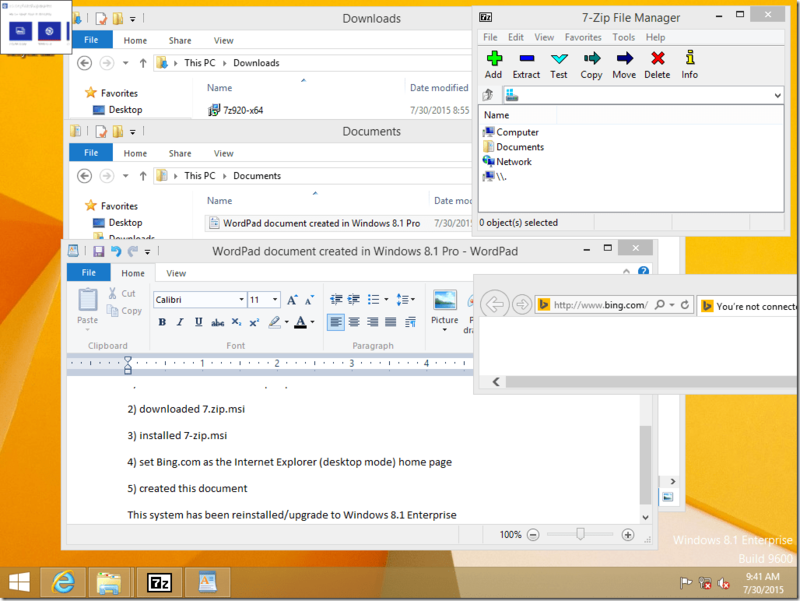 I installed a Windows App (Adobe Photoshop Express), 7-zip, created a WordPad document, and set Bing.com as my home page. Running Windows Setup from a Windows 8.1 Enterprise ISO. I get to keep my settings, personal files, and apps! After a few reboots and logging in as my original admin account, we see that Windows is now Enterprise edition and there are no TargetEditions available. The upgradation (yes, that is a real word) is complete! We also see that the customizations I made were retained. 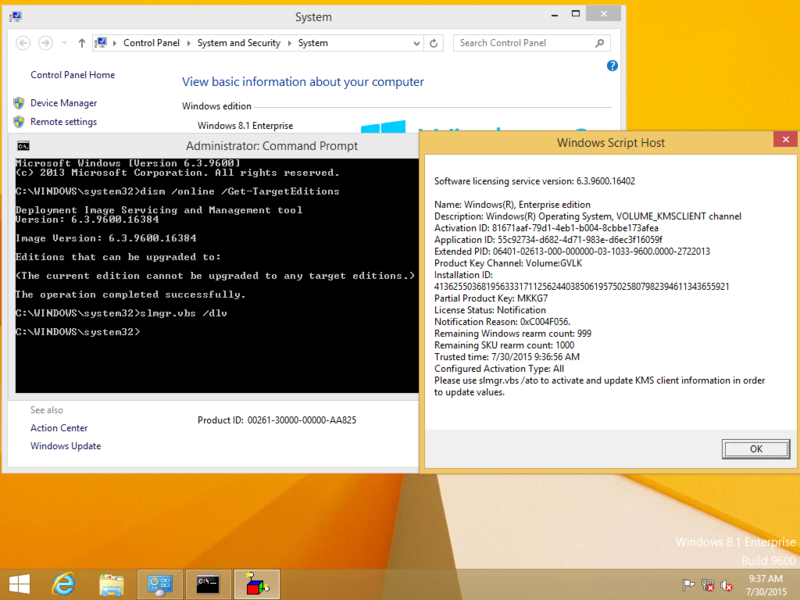 Lastly wee see the old Windows installation was backed up (renamed). 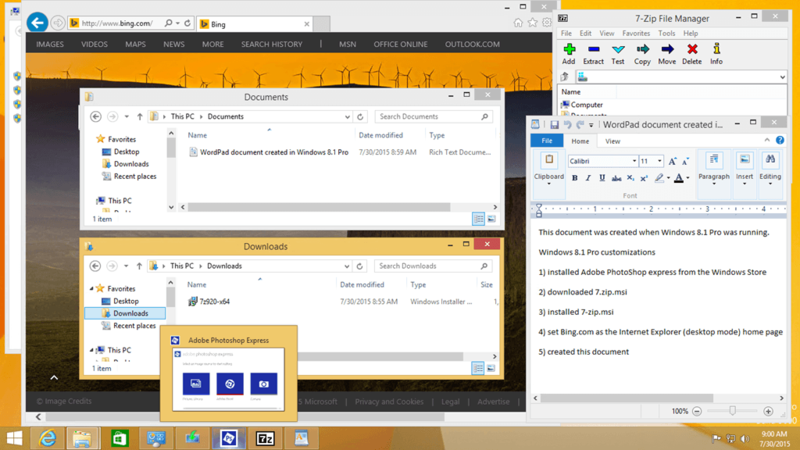 I haven’t duplicated the effort for Windows 10 yet, but I’m confident the same scenario is in play. I can say that DISM will not change the edition of an online image (a running Windows computer). However, the Windows Store can do that for at least some upgrade scenarios, although I’m 99.9% sure Enterprise edition will NOT work this way. For a recent customer I was going through all of the requirements to implement DirectAccess. One that I stumbled on a bit was that DirectAccess requires DFS-R replication but I wasn’t certain how to verify what replication type was in use. After some digging, some assumptions, and some great tips from fellow Catapult Systems consultants, here’s the scoop. Note: FRS is the abbreviated acronym for NTFRS. 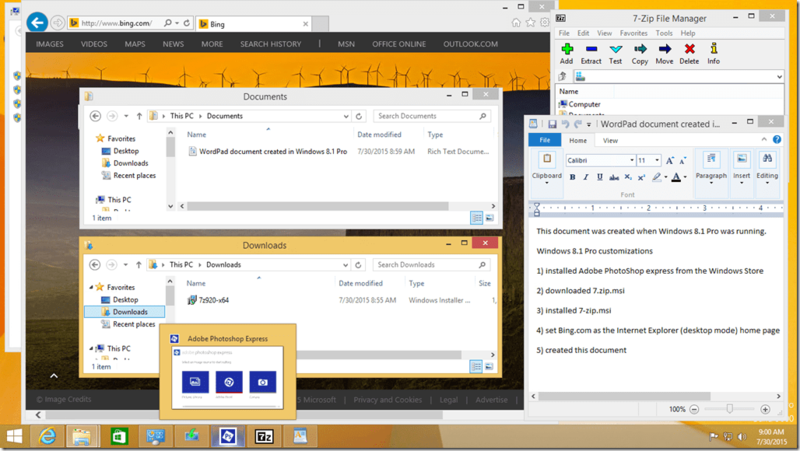 open Event Viewer \ Applications and Services Logs\ File Replication Service. If there is recent activity then FRS should be in use. if <SYSVOL>\SYSVOL_DFSR\SYSVOL exists, then DFS-R should be in use.